Northern California’s Castle Crags are most often viewed while driving north on Interstate 5. Since leaving Redding the freeway passes through seemingly unending forest as it winds first around Shasta Lake and then up the canyon of the Upper Sacramento River. Eventually I-5 rounds a bend and suddenly the Crags present themselves. The soaring granite spires, too numerous to count huddle together to form a massive rampart towering thousands of feet above the highway. Then, nearly as suddenly the freeway rounds another bend and the Castle Crags disappear, to appear only in tantalizingly brief moments before reaching Dunsmuir. With the sole exception of majestic Mount Shasta, the Castle Crags are the most recognizable landmark in California north of Redding. Their rugged towers seem to be alone amidst a sea of densely forested ridges. In reality, the Castle Crags pluton represents only a portion of the whole Castle Crags Wilderness. Containing only 10,500 acres, the wilderness area is small, particularly by California standards. Nonetheless, it compensates for its diminutive size with a tremendous amount of jaw-dropping scenery, wild characteristics, and the opportunity for uncrowded, year-round recreation. In addition to the Castle Crags themselves, the wilderness area takes in a couple of glacial cirques, containing a total of five excellent lakes, with more lakes just outside the fairly arbitrary wilderness boundary. A cluster of high peaks crowns the western half of the wilderness, offering excellent off-trail scrambling and fantastic vistas. Above all, Mount Shasta is visible from much of the wilderness. The wilderness offers something for nearly outdoor enthusiast. Hiking is excellent, with great peaks and lakes demanding visitation. Nearly unlimited rock climbing potential exists within the Castle Crags themselves, most of which remains unexplored by all but a mere handful of adventurers. Fishing is good in most of the lakes. Winter brings opportunities for skiing and snowshoeing. 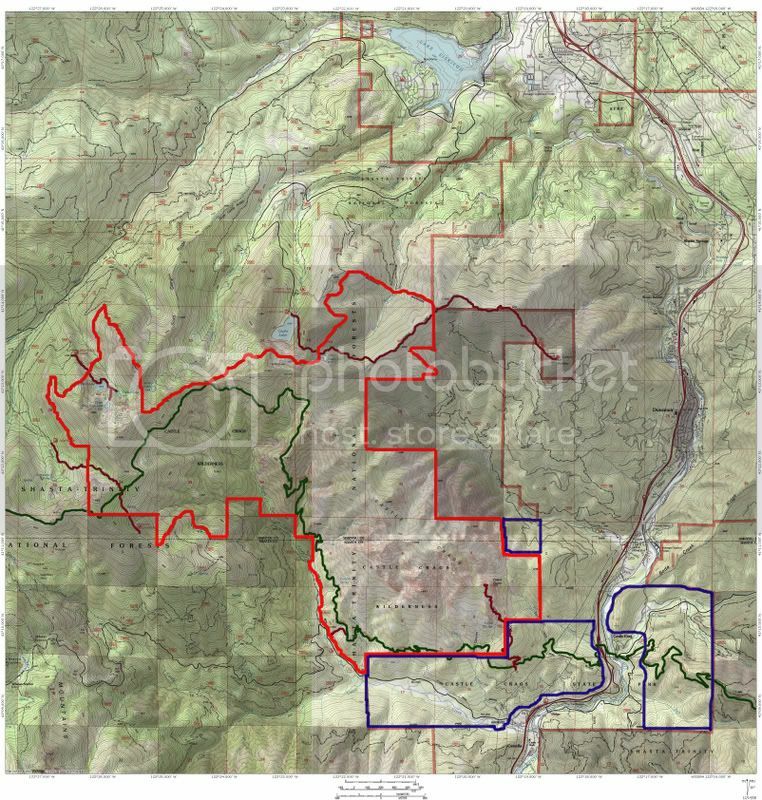 While a page for the Castle Crags currently exists on Summitpost, it focuses on the Crags themselves and omits any information on the rest of the wilderness area. Moreover, the page is understandably oriented more towards climbing in the Castle Crags and does not offer as much information in the area of hiking or other recreational opportunities. Thus, the purpose of this page is to highlight the entire Castle Crags Wilderness, the Crags themselves as well as the high western peaks and the lakes beneath them. The Castle Crags Wilderness is the only designated wilderness in the mountains known as the Trinity Divide. This range is the easternmost subrange of the Klamath Mountains, which stretch from the northern Yolla Bolly Mountains west of Red Bluff to the Siskiyou Mountains in Oregon. The Castle Crags seen from the summit of "Castle Peak"
The Trinity Divide is so named because it constitutes the divide between the Sacramento River and Trinity River headwaters. The waters flowing east from the Divide form the beginnings of the Sacramento River, California’s longest and largest, which empties into the Pacific Ocean at San Francisco Bay. The waters flowing west from the Divide are the headwaters of the Trinity River, which flows nearly 200 miles to the west, where it flows into the Klamath River and proceeds another 50 miles before emptying into the Pacific Ocean south of Crescent City. The Trinity Divide itself is the northern most section of the Trinity Mountains, a range that is found between the Sacramento and Trinity Rivers. None of these mountain regions are to be confused with the Trinity Alps, which lie to the west. Due to its proximity to Interstate 5, the Trinity Divide is probably the most visible part of the California portion of the Klamath Mountains. Like the rest of the Klamaths, the Trinity Divide is composed of confusing array of rock types. The granite of the Castle Crags differs dramatically from the sedimentary rock of the nearby Gray Rocks, which again differs dramatically from the serpentine and peridotite that constitutes most of the Eddy Range. Due to the unusual soils in the Klamaths, numerous rare tree and plant species are found in the range. These trees are present in the Castle Crags Wilderness, most notably in the western, higher portion of the wilderness. The Castle Crags Wilderness can be divided into two areas. To the east, bordering the Sacramento River is the Castle Crags themselves. This area is composed of heavily glaciated granite. The glaciers carved the rock into what seems like an endless array of jagged spires punctuated by occasional Yosemite-like domes. Although the area looks alpine, its elevation is lower than one might expect. The highest point in the Crags is 6,544, although most of the formation lies between 4,500 and 5,500. Only one peak, Castle Dome, is officially named. Several other peaks are known unofficially. “North Pinnacle” is the highest point in the Castle Crags and requires a long approach and technical climbing to reach the summit. “Battle Mountain” is another high peak at the western end of the Crags massif. Several peaks at the eastern end of the Castle Crags, including “Mount Hubris” and “Six-Toe Rock”, are popular with climbers. The western half of the Castle Crags Wilderness is remarkably different from the more popular eastern half. Although this area is prominently visible from the town of Mt. Shasta, the area is surprisingly anonymous. Consequent to anonymity, all of the peaks in this area are unnamed. While the eastern half is low with enormous exposed spires of rock, the western half is higher, and is characterized by a series of long ridges punctuated by a few high peaks. Highest among them is “Harry Watkins”, which reaches 7,200 feet. Only a little shorter is “Gray Rock Dome” at 7,070. “Castle Peak”, a little further east, reaches an elevation of 6,617. What sets the western half of the wilderness apart, aside from the higher peaks, is the presence of two glacial lake basins. The Gray Rock Lakes are found nestled in a large granite cirque between “Harry Watkins” and “Gray Rock Dome”. These lakes, found in beautiful rocky bowls, see little use and are prime destinations for hikers and make a great basecamp for exploring the surrounding peaks. A couple miles to the east is the Castle Lake Basin. Containing just under 50 acres, Castle Lake is one of the largest and deepest (110 feet) lakes in the Klamath Mountains. Its waters are particularly pure, which is one of the reasons the University of California established a limnology research station at the lake. Although Castle Lake lies just outside of the Castle Crags Wilderness boundary, other, smaller, lakes in the same lake basin are within the Wilderness. Heart Lake is most notable of these. Little Castle Lake, also in the Wilderness Area, lies not in the Castle Lake basin, but at the head of the Ney Springs Canyon. This canyon and the western half of Mount Bradley form large salient in the wilderness boundary on its northeast corner. Harry Watkins 7,200 feet Harry Watkins is named after a local after a local man in Mount Shasta who was well known for working with kids in the community The Watkins Glacier on Mount Shasta is also named after him. A large gneiss intrusion, it is the highest peak in the Castle Crags Wilderness. Gray Rock Dome 7,070 feet Gray Rock Dome forms the southern perimeter of the Gray Rock Lakes Basin. The peak is prominently visible from the town of Mount Shasta and received its ‘dome’ appellation due to its appearance from the direction. Castle Peak 6,617 feet Rising high above Castle Lake, Castle Lake is possibly to most scenic of the Castle Crags Wilerness’ high peaks. Aside from the massive lake at its base, it also hosts Little Castle Lake and gorgeous Heart Lake. It has rugged cliffs plunging steeply into the sapphire waters of Castle Lake. Mount Bradley 5,556 feet The highpoint of a long ridge splitting off of the main crest of the Castle Crags Wilderness, Mount Bradley towers above the city of Dunsmuir. It prominence above the Sacramento River gives it a stature somewhat out of proportion with its lower elevation. A lookout tower occupies its summit. Mount Hubris 5,400 feet Mount Hubris is a massive granite spire in the Castle Crags. It is home to classic multi-pitch routes. Castle Dome 4,966 feet Castle Dome is any many ways the classic peak of the Castle Crags. Rising dramatically above the Sacramento River, it has a brooding presence. The summit is reached via the Castle Dome Trail as well as multi-pitch routes climbing the east face. Six Toe Rock 4,966 feet A small granite spire just south of Castle Dome, Six Toe Rock is a popular rock with climbers. It is accessed via the Castle Dome Trail. Wintun Indians originally inhabited the area surrounding the Castle Crags Wilderness. Prospectors from the Gold Rush in the Sierra Nevada found there way north in the early 1850’s and sparked several rushes in areas throughout the Klamath Mountains, particularly in the Trinity Alps and the mountains around Yreka. The Castle Crags were also prospected and a few mines were established, although the area was not incredibly profitable. Pressure from the miners aroused the ire of the Wintun and in 1855 the Battle of the Castle Crags took place. The location of the battle is known to be somewhere between “North Pinnacle” and “Castle Peak”. This is reportedly the last battle in the American West in which the Native-Americans fought solely with bows and arrows. Famed western poet Joaquin Miller participated in the battle and was wounded in the thigh and cheek (some now claim he in fact did not participate in the battle). Miller wrought an account of the conflict in a short work called “Battle of the Castle Crags”. While the mines were playing out, the Southern Pacific Railroad built its line up the Sacramento River Canyon, which opened the area up to commercial logging and tourism. A large resort was located in Ney Springs Canyon, just outside the current wilderness boundary. In the 1930’s, local citizens moved to raise funds to protect a portion of the Castle Crags. Enough money was raised to establish the Castle Crags State Park. The bulk of the Crags and surrounding mountains passed under the stewardship of what is now the Shasta-Trinity National Forest. In 1984 the Castle Crags Wilderness was established as part of the California Wilderness Act. Since then, no lands have been added to the wilderness, though several thousand acres of adjacent lands retain their wilderness characteristics. Castle Crags State Park borders the southeast corner of the Castle Crags Wilderness. Ironically, little (if any) of the granite portion of the Crags falls within the state park’s boundary. Instead, the park functions as a toll-taker for those wishing to enter the Crags to hike or climb. Nearly all of the established climbing routes and the trail to Castle Dome must be accessed via the state park. A large campground and a few picnic areas are also provided by the park. Castle Crags State Park also contains a sizable tract of land on the eastern side of the Sacramento River. The Pacific Crest Trail passes through this portion of the park. The Castle Crags Wilderness has few trails. The jagged terrain in the Crags themselves is not particularly conducive to trails. The western half has only two trails, but is more open and cross-country travel leads to excellent destinations. The Castle Dome Trail is the most popular trail in the Castle Crags Wilderness. At only 2.8 miles, it is fairly short, yet it climbs 1,900 feet to the base of Castle Dome. The lower portions of the trail pass through dense forests contained in Castle Crags State Park. The route enters the Wilderness 1.25 miles from the trailhead. Views of the Crags and Mount Shasta are excellent. A fee is required to enter the state park. This short trail is only 0.5 miles long and climbs 550 feet to connect to the Pacific Crest Trail. Aside from connecting to the PCT the trail is used primarily by those who wish to enter the Crags without paying the fee at the state park or by people hiking to Burstarse Falls, a seasonal waterfall on the southern flank of the Castle Crags. The North and South Soapstone Trails begin on opposite sides ridge connecting the Castle Crags to the main crest of the Trinity Divide. They are remote and seldom used since they lead nowhere except the PCT. They intersect the Pacific Crest Trail at the same point on the ridge. Only 1mile in length, the Gray Rock Trail packs an incredible amount of scenery in its short duration. The trail traverses the wall of a canyon, high above the creek fed by the destination lakes. After moderate elevation gain it drops down to the shores of Gray Rock Lake, a beautiful lake contained in a classic glacial cirque. The trail winds around the eastern side of the lake before splitting. One fork descends to Timber Lake while the other climbs to Upper Gray Rock Lake, the prettiest of the three. Although short, this trail leads to a tremendous amount of cross-country exploration, including the summits of “Gray Rock Dome” and “Harry Watkins”. More information on these routes are available here. One of the best trails in the Mount Shasta area, this trail begins at the outlet of Castle Lake. It climbs 400 feet in 0.5 miles as it passes out of the Castle Lake basin. It goes by a small tarn before dropping down to Little Castle Lake, crossing into the Castle Crags Wilderness as it does. Views of Mount Shasta are good from this area, particularly if one climbs up the rocky headwall above the lake. The trail then climbs up the western shoulder of Mount Bradley, which is in fact a long ridge. From here the route follows the ridgeline for 3.5 miles to the Mount Bradley lookout, leaving the Castle Crags Wilderness at 1.25 miles. Views from the lookout are superlative and include Mount Shasta, Mount Eddy, and close-up views of the Castle Crags. Use trails branching off of the Little Castle Lake Trail also provide access to Heart Lake and “Castle Peak”. Following the route of an old diversion channel, the Root Creek Trail leads from the PCT to Root Creek. Although the creek itself is nice, the trail is nondescript, passing through seemingly endless forest on the way to the creek. The decaying diversion channel is obvious at various points along the way. While the trail is not particularly exciting, it does provide access to Root Creek Falls, one of the prettiest cataracts in the Shasta region. The vista of the falls with Castle Dome looming high above is a sight not to be missed. The Pacific Crest Trail, which snakes its way from the US border with Mexico to the US border with Canada, passes through the Castle Crags Wilderness for a total of 14.5 miles. The trail gains just under 6,000 feet, climbing from about 2,900 feet to roughly 6,600 feet. This portion of the PCT is part of the longest roadless section of the trail in the Mount Shasta area. From the trailhead at Castle Crags State Park to Gumboot Saddle, northwest of the Castle Crags Wilderness, the PCT travels 25 miles without crossing a road. Aside from those hiking the PCT, many people use this section of trail for backpacking trips. If ones begins at Gumboot early enough during the summer, it is possible to do the whole section in a day. While there are many seasonal creeks along the route, Popcorn Spring is the only reliable source of water along the PCT within the Castle Crags Wilderness. The Pacific Crest Trail is also used to reach Burstarse Falls, the only named waterfall within the wilderness. The falls are reached via the Dog Trail. The PCT also passes through 7 miles of Castle Crags State Park. Rock Climbing is popular in the Castle Crags. Most of the climbing activity is centered on the southeast corner of the Crags, particularly on the Cosmic Wall. Numerous other routes are found in the area. Nearly unlimited climbing potential awaits those intrepid enough to venture into the heart of the Castle Crags. More information on climbing the Crags can be found here. This is another excellent link for climbing in the Castle Crags. The Castle Crags Wilderness offers year-round recreation. Due to their relatively low elevation, hiking, backpacking, and rock climbing are popular spring through fall. During the winter, snowshoeing out of Castle Lake is excellent and skiing is possible at the Crags themselves. Images of skiing in the Crags is available here. The main point of entry into the Castle Crags themselves is through Castle Crags State Park. The primary northern and western access points are at Castle Lake and Gray Rock Lakes. If traveling on I-5 (whichever direction) exit at Castella and head west about 0.25 miles to the entrance to Castle Crags State Park. From the town of Mt. Shasta, head west on W. Lake, crossing over I-5. At the stop sign, turn left onto Old Stage Road. After 0.25 miles, veer right onto WA Barr Road. Continue south, crossing over the dam that impounds the Sacramento River and forms Lake Siskiyou. After crossing the dam, take the first left, following the road 7 miles until it ends at Castle Lake. From the town of Mt. Shasta, head west on W. Lake, crossing over I-5. At the stop sign, turn left onto Old Stage Road. After 0.25 miles, veer right onto WA Barr Road. Continue south, crossing over the dam that impounds the Sacramento River and forms Lake Siskiyou. From the dam, continue 9 miles to the west, passing the lake and continuing up the Sacramento River. After 9 miles, turn left, crossing over the Sacramento River on a Forest Service bridge. Veer left after the bridge, then make a sharp right hand turn onto Forest Road 39N45. The well-maintained dirt road may not be signed, but it is hard to miss. It parallels the river for 1.25 miles before intersecting Forest Road 39N41. At the intersection, turn left onto FR 39N41. Again, this road may not be signed, but the level of wear on the road makes it obvious which way is correct. Continue up the road for 1.2 miles. At this point the road’s condition degrades dramatically and those with sedans or who are uncomfortable negotiating steep, severely eroded routes should park here and hike the 0.25 miles to the Gray Rock Lakes trailhead. For those with 4x4, simply continue to the trailhead. Campgrounds are available at Castle Crags State Park and at Castle Lake. Additional campgrounds can be found further afield at Gumboot Lake, northwest of the wilderness area and at Lake Siskiyou, to the north. Dispersed camping is permitted throughout the Castle Crags Wilderness. The best campsites are at Gray Rock Lake, though many other excellent sites are found along the northern half of the wilderness. Mount Shasta towers beyond the "Gray Rock Dome"
The town of Mount Shasta is the best source of supplies in the region. It is also the closest community to the Castle Lake and Gray Rock Lakes trailheads. Dunsmuir is also a good place for supplies and lodging, if one is entering the wilderness from Castle Crags State Park. Amaratti's at the gass station in Castella also provides victuals. Normal wilderness rules and ethics apply within the Castle Crags Wilderness. A free permit is needed for entry into the wilderness. They may be obtained at the USFS ranger station in Mt. Shasta or at the State Park. A $5.00 fee is required for entry into Castle Crags State Park.